If you ever go to a manufacturing show, you’ll see lots of big, incredibly expensive machines cutting little pieces out of big blocks of metal and other materials. The machines are controlled by computers and can even work in the dark, with no human nearby. The system is called CNC, which stands for Computer Numeric Control. Now, you can get one of these for your home workshop. They not cheap – $935, and the work area is only 1 square foot. But, hey, we’re talking robot manufacturing. A company called Inventables has a new version of their X-Carve machine, which uses free “Easel” software you can download from the Web. You can watch a demo on YouTube from a guy calling himself “The Drunken Woodworker.” Starting out in Adobe Illustrator, he typed “Be Curious” and turned it into individually carved letters in walnut, tipping the “C” to add a little humor. Basically, this is called a milling machine, because it “mills” pieces of material out of a block to end up with the desired piece. 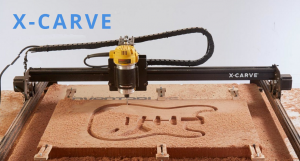 X-Carve can carve soft and hard materials in a variety of metals, Corian plastic, cork, foam, wood and fiberboard. A larger carver, with a work area of 31 square inches, costs $1,400. Perhaps because of the expense for home users, Inventables took its show on the road, awarding a 3D printer to one school in each state. The contest was held in response to President Barack Obama’s challenge to schools to teach digital manufacturing. Schools that missed out on the contest can enter another one sponsored by NewMatter.com. New Matter is donating more than $200,000 in 3D printers to schools throughout the U.S. The deadline for applying for the grant is Feb. 5. A similar milling machine is DreamMakers’ EvoOne. It raised more than double the funds it sought at Kickstarter.com. We’re skeptical of crowd-funded products, but this one is backed by Digital Trends, Makezine, Arduino and many other companies. Its work area is around 15 by 9 inches and it claims to provide the ease of use of 3D printing with the precision, speed and versatility of CNC.